The OFFICIAL Scary-Crayon Blog! » Jungle Panda, Death, and Hot Flash Comics! Jungle Panda, Death, and Hot Flash Comics! First up, a guest piece from Ragey of Random Action Hour (part of the Random Hoo Haas network of awesome stuff). As a fellow connoisseur of freakish bootleg toys, Ragey has graced the site with a review of a Jungle Panda action figure! Who or what is Jungle Panda, you ask? You'll have to read the review to find out in depth... but let's just say that he's Kung Fu Panda's unhinged and malnourished cousin from the jungles of Myops. We've also got a review of the Mad Monsters Series 2 Grim Reaper figure from Classic TV Toys. I really, really like this toy -- no, love this toy -- and yet I should probably strongly dislike it for at least one major reason. Instead, Daddy Death's got me fawning over him and almost set to dive headlong into another toy obsession not unlike the Power Rangers figure kick that I still haven't written about. Why didn't anyone tell me these things were so bloody much fun?! The other comics have appeared elsewhere but not previously on SC, so I include them as an excuse to plug other sites and such. I mentioned that Toy Bender contest a while back -- well, Beverly Crusher was the figure that I won. Hurrah! And the Optimus and Prowl comic comes from a guest review that I did of Samurai Prowl over at Articulated Discussion. It's Transformers Week over there, so be sure to visit and check out all of the fun (or not-so-fun, in the case of Prowl) Transformers content! And while we're plugging other sites, you should really visit Geek Creek by Monte Williams! He apparently goes to a local canyon and takes cool photos of action figures in natural settings -- very cool stuff, even if pics like that destroyed Animated Megatron cause me to wince in pain. Monte also writes about pop culture and other miscellany on Retrobate and the Lowbrow Literati column on PopMatters, so check those out too. Aaaaaaand that's all I've got for now! Expect more Hot Flash comics next time, since I was serious when I said that about Grim. Grim's a bloody toy comic goldmine. Great article Ragey, I'll have to check out your site sometime. Bootleg toys can be a real hoot. Wes, that Death figure is bloody fantastic! Yes, it is ridden with flaws, but I love the kitchy 70s-ness. I just wish it was cheaper. But, I think the real lesson here is that it's nearly impossible to screw up a Grim Reaper doll. BTW loved the picture of Death with Sarah Jane. I finally got to watch that show a few days ago when Sci-Fi had a marathon of sorts. I found it very enjoyable. It reminded me of alot of great kids shows I used to watch, the kind that they just don't seem to make in the US anymore. Also, great DPH comics. Am I to understand that the Hellboy action figure doesn't come with his trademark jacket? That's like a TMNT figure without the bandanna! Regarding Death, yeah, he is more expensive if you order him by himself. Tack on a few other things to your order, though, and it'll start to seem like a good deal... maybe even a really good deal. I figure I'll wait until I want a bunch of stuff to make my order. Not super cheap, but it averages out to $5.50 per figure even with the shipping. Not bad. And I'm glad to hear that you got to watch some TSJA! It really is a fun show, and that Lis Sladen is still quite the looker. Were the episodes you saw from Series 1 or Series 2? 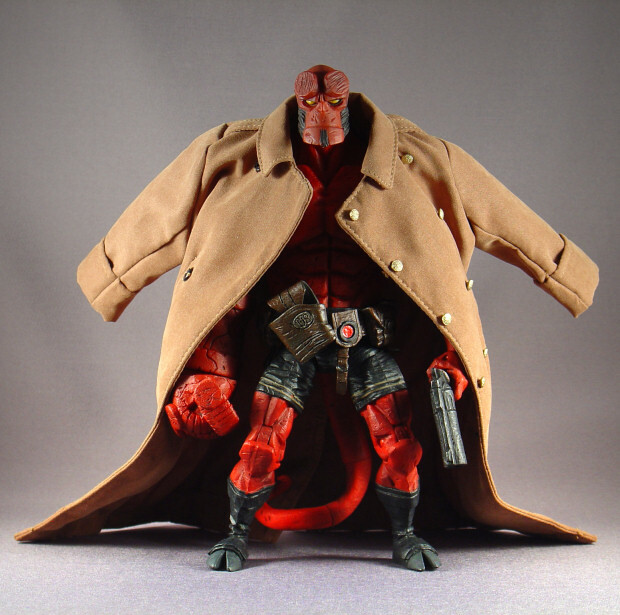 And yeah, the normal Hellboy figure didn't come with a jacket -- apparently the version with the jacket was some sort of convention exclusive or something. It was sent as a separate bagged accessory to retailers as well, and those go for quite a bit on the secondary market. More than I'm willing to pay for a friggin coat, anyway! So yeah, I took Thing's. I don't know which series. Whichever one had the episode where "Mr. Smith" turned out to be an evil alien crystal that's been using Sarah Jane all along. Ooh, that was the Series 1 finale. Next time you watch, you should do so with a printout of our TSJA drinking game! And how about that Chrissie, eh? Well, I'm not much of a drinker (though it being summer I have been digging pi�a coladas lately), plus I was cleaning the computer desk while I was watching, so I didn't get to do that. Maybe next time, I'll grab a mild pi�a colada and give it a try. And, yes Chrissie is the character you love to hate. There was actually a Jungle Panda in a dollar store out here (part of a chain that is dying because of Dollarama), and I kind of wish I'd bought it for the WTFactor. OMG, I just looked on the "Classic TV toys" website, and they even have blank bodies and individual parts. I could have a lot of easy "build your own action figure" fun with this. Yeah, I know! That's part of what's gotten me so excited about these things -- whereas my previous custom figures have required full repaints and annoying issues with paint rub around joints, I could conceivably just get the right outfit, the right head... and be finished. It's awesome. Of course, Mego-style customs can be pretty involved too, but it's nice to know that I can start fairly simple here! Unless one is just doing simple headswaps and minor paint apps, action figure customs are fairly involved right out of the gate. And as far as Chrissie being the character you love to hate... she might have started off that way for me, but now she's the character (or at least a character; Sarah Jane and Rani are quite nice themselves) I'd love to love. Juliet Cowan is a cutie. Hmmm. Ginger...a doctor...too bad she wasn't British.